I looked up and met his kindly eyes. I had been avoiding them as I sat down, not sure what I would find. He didn’t say anything. I think he knew that was a sensitive subject for me. Tears started to leak out of the corners of my eyes. That was the last thing I wanted, in my doctor’s office of all places. By now I averted his gaze. I remembered that conversation well—I had hoped he had forgotten. Clearly he hadn’t. My mind went back over the past year. It had been hard physically, mentally, emotionally, even spiritually. I wanted to be there to support, but even despite my want-to, it was hard nonetheless. While in some respects I feel like my body has betrayed me and let me down, I have to give it grace because I’ve demanded a great deal from it. I’ve pushed it to extremes and then expected it to give even more, because the demands around me didn’t stop. It makes me grateful that as my comforter, the Holy Spirit doesn’t wear out or wear down! Even now, in my weakness, He is my strength. When I have nothing left to give, He promises that His grace is sufficient for me. When my nights are tearful because the stresses are greater than the answers, He reminds me that joy comes in the morning. When my mind races, searching for answers, He encourages me to be still and know that HE is God. 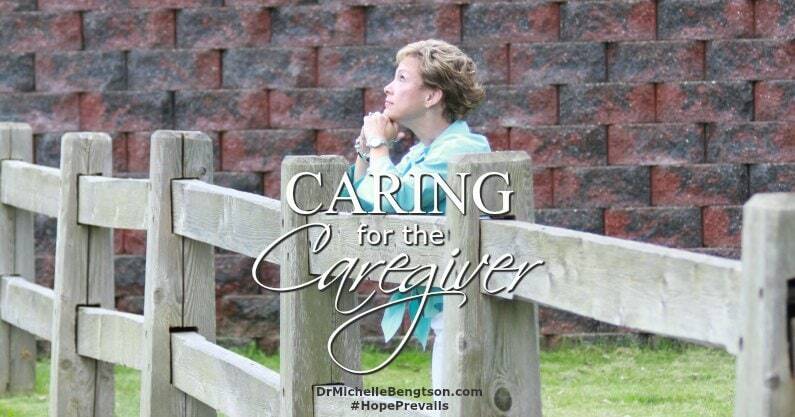 Knowing when to rest or ask #God or others for #help is hard for a #caregiver. The hardest parts of being the caregiver, at least for me, have been knowing when to stop and rest, when to ask God and others for help, and recognizing that we weren’t meant to carry it all. Yes, we are called to share one another’s burdens, but Christ was the only one who was ever meant to carry them. He promised us, in all our frailties, that His yoke was easy and His burden light. 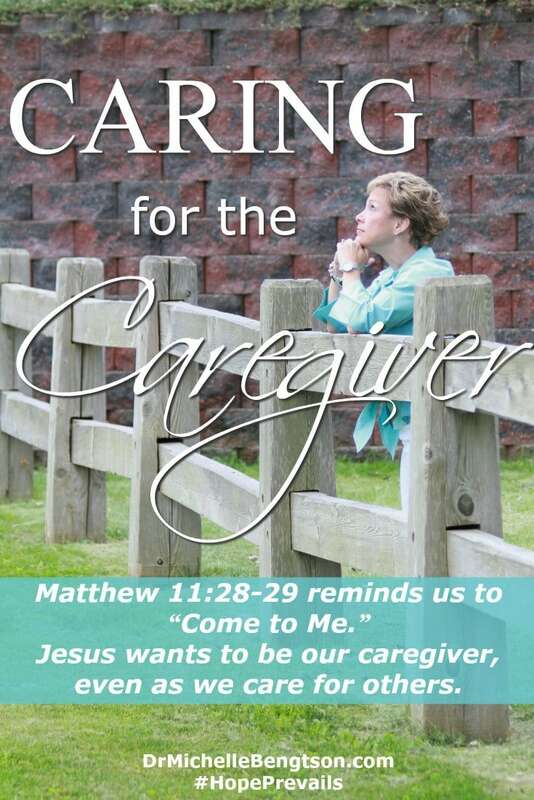 The key is that He first says “Come to me…” He wants to be our caregiver, even as we care for others. Will you let Him do that for you? Beautiful and so true ! The caregiver role can be totally exhausting. We get worn down and out of whack before we ever realize what is going on. Thankfully God’s Word assures we don’t. Instead, He promises to steps in and see us through!! Thank you for releasing this encouragement !!!! Isn’t it wonderful that we can stand on God’s Word and His promises when we are weak and need strength? HE is our hope and encouragement on the hard days! Because of Him, #HopePrevails! Thanks Nicole. I don’t think it hurts to have a reminder to extend the same grace to ourselves that we would extend to others. Michelle, This is so needed. We just run ourselves ragged daily, but having the added responsibility of caregiving could send us over the top. I have not been in that situation, but I have watched others walk through it. This is much needed wisdom. I’ll keep it in mind and I’ve shared on social for anyone who might need it at the moment. Thank you for sharing these insights and the Bible verse from Matthew. Thank you Leslie! Caregiving is hard, and it’s easy to lapse into guilt and feeling weary. But His grace is sufficient! Words my eyes and my heart need! With my mum recently passing away, I’m realizing that my body has been in clenched and waiting mode for a long time. I’m working at healthy habits, and your experience shared here is underscoring the truth for me! Michele, I’m so sorry to hear about your mum recently passing away. I remember the days of taking care of my ill mother when she had cancer and then the days after she passed. It was a physically and emotionally draining time. Please give yourself lots of tender loving care, just like you would have given her! Hugs my friend. I’ve heard the being the caregiver is the hardest! But I love the saying that you should be given grace! I think we all need more grace in our lives. I’m so sorry about your mom and wish you such peace. Our experiences have too much similarity – I felt a little uncomfortable reading this! My word wasn’t exhausted, it was overwhelmed. I used it frequently and when my doctor substitued overwhelmed with depressed, I cried rivers. My word was better. But either way, I needed to learn to treat it, and to give myself grace! Wonderful post!!! I’ve never had to experience the life of caregiver, but I can only imagine how hard it must be. Thanks for the truths spoken in this article. I love this post! It really is exhausting. Pinning this to share for others that might need the encouragement. Michelle, this is such a great post, it is so easy for us to try and carry everything. When my daughter needs to carry a pile of something, she often tries to get it all in “one trip” even if it is too much. To me, this is what it feels like when we don’t allow anyone to help us, but that is why we have friends and those we love and most importantly, Jesus! We need to lay it all down at His feet and allow Him to care for us. Thanks for linking up with #TuneInThursday yesterday. See you next week! Michelle, my heart goes out to you and the difficult road you’re walking right now. I pray that ‘this too shall pass’ but in the meantime, my hope is that God will whisper words of encouragement to your soul, helping you to pause at just the right times to soak in His love and peace. That is something that we always forget about, Thanks for reminding us. Sometimes, it’s not only exhausting, but as caregivers we may have a hard time asking for or receiving help when it’s offered. Yet, doing so allows others to use their gifts and receive God’s blessings. I’m praying for you as you walk through this difficult time. May you sense His presence in profound and tangible ways. I’ve never been a caregiver, but I can only imagine how hard it would be! So glad you went to your doctor to get help for you! This reminds me about being a mom. We give and give till exhaustion, but we need to remember our needs to. We need to fill ourselves first so we can pour it out to others.